Miroslav Volf is Director of the Yale Center for Faith and Culture and Henry B. Wright Professor of Systematic Theology at Yale Divinity School. His other books include Exclusion and Embrace: A Theological Exploration of Identity Otherness, and Reconciliation; The End of Memory: Remembering Rightly in a Violent World; and Against the Tide: Love in a Time of Petty Dreams and Persisting Enmities. - Publisher Miroslav Volf, a systematic theologian, interprets texts of the Christian scriptures and invites others to also delve into, as he puts it, the site of God's self-revelation for the sake of humanity's integral salvation. 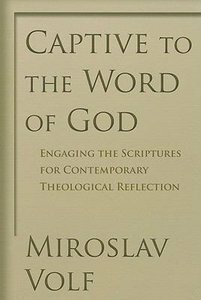 About "Captive to the Word of God"
Miroslav Volf, a systematic theologian, interprets texts of the Christian scriptures and invites others to also delve into, as he puts it, the site of God's self-revelation for the sake of humanity's integral salvation.